Animal life in Vieques, like all of the Virgin Islands includes a variety of interesting creatures on land like iguanas, deer, pelicans, hummingbirds, herons, bats and more. In the water the most famous are probably the flagellate protozoa, which inhabit Bah�a Mosquito and other bays on the south shore. They are responsible for the incredible bioluminescence! There are also various lizards, frogs and insects. So from the fierce looking iguana to the graceful heron, let's take a look at what you can expect to see on land and in the sky while sightseeing around Vieques! Iguanas are actually not native to the Caribbean but are at home in places like Madagascar, Fiji, Galapagos Islands and Tonga; They were brought to the West Indies as pets and then left out in the wild once the owners got bored of them. Various species exist. Baby iguanas are bright, almost fluorescent green while adults range from a dark green to brown and black. An adult iguana can get up to 6 feet long including the tail, which makes up about half of the iguana's length. The iguana's skin is rough and there are pointed scales on the back of the neck. 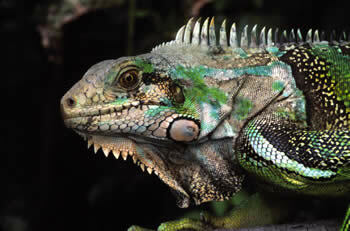 Iguanas are often found high up in tree tops enjoying the sun and eating there favorite food; leaves. In the Virgin Islands you may see iguanas in the trees and bushes around your resort or scurrying across paved roads in forested areas. Some iguanas in resort areas will approach you as they may have gotten accustomed to being fed flowers, lettuce or leaves by staff and visitors. Although they may appear domesticated you should not corner or startle iguanas as they use their tail as a defensive whip. Lizzards are a common site in the Virgin Islands. The largest lizzard found in Vieques is the iguana discussed above. Other species of lizards include the anole, a small lizard that eats insects and lives in trees and around rocks in forested areas of the islands. A visible indicator of male anoles is a red and green throat fan that it displays during courtship. Another lizard that you might see on the walls of outdoor restaurants or that might find its way into your villa or hotel room is the house gecko; also called a 'woodslave". The house gecko eats bugs and will often appear on walls and ceilings at night close to outdoor lights. Many insects are attracted to light making this location a prime spot for a feast. Frogs can also be seen in the islands but they are more often heard, particularly after a rain shower at night. 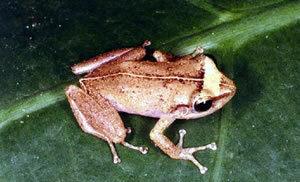 The best known frog is the coqui, national symbol of Puerto Rico! Hermit crabs have soft abdomens which require the protection of a shell. They do not make their own shell, therefore as they grow they must find larger shells to occupy. Their lives are spent searching for and occupying shells of other animals. Other crab species found in the Virgin Islands include the ghost crab that can be seen quickly moving along beaches and a few species of land crabs that burrow into the ground and can often be seen at night or just peering out of their holes in the day. There is a small deer population in the Virgin Islands. The white tailed deer was brought to the islands by colonist in the late 1700's for hunting purposes. Bats are said to be the only animal that is native to Vieques. Bats can be found in caves in less populated areas of the island and are sometimes spotted flying at night. It is not uncommon for several dozen bats to roost together in a cave. They are primarily insect eaters and nectar drinkers however there is a fisherman! The fisherman bat is a threatened species in the Virgin Islands. The bat roosts in caves near the sea, woodlands and in roofs of old houses. Through the use of echolocation or sonar, the bat detects ripples caused by fish swimming close to the water�s surface and uses its long, curved claws to catch them, thus the name fisherman bat. They are good swimmers and they use their wings as oars. Pelicans are large aquatic birds with long bills. They feed on schools of small baitfish and can often be seen swooping down and diving into the sea. They resurface with about a gallon of water and hopefully fish in their large pouch. They sit at the surface letting the water drain while the fish remain trapped and get eaten! They are fun to watch and can often be seen at the beaches and coastal areas around the Vieques. The brown pelican is found throughout the Caribbean. The effects of poaching for eggs, young and adult pelicans, disturbance of nestling colonies by humans and reduction of food resources have caused the pelicans numbers to decline. The brown pelican is found in the Virgin Islands and is federally endangered. The Sea Gull is also known as the laughing gull because of its clear 'ha, ha, ha' call. It is a medium sized bird found worldwide. These webbed feet birds are usually found near water in the Virgin Islands and are particularly common in areas where fishermen clean their catches. Their feathers are white, gray and black. They are omnivorous birds, however they often scavenge. They are often seen stealing fish from pelicans; so daring are the sea gulls that they sometimes take the fish right from the pelican's bill! Hummingbirds are small, quick birds. Commonly found in the Caribbean and parts of North America. They are usually brightly colored. They feed on nectar from plants and small insects caught in flight. You will find these delightful little birds flying around the flower beds of homes and resorts in the islands. The bananaquit is often called 'yellow bird' account of its bright yellow chest and 'sugar bird' on account of its affinity to sweets. Homes owners in the Virgin Islands often hang bird feeders with sugar or with sugar water for the bananaquits! The Virgin Islands is home to the great blue and little blue heron. The great blue heron stands 3 feet tall with a wingspan of approximately 7 feet. It is a slate blue color and is a graceful wader and often stands motionless while fishing. It eats fish, crabs, lizards and mice. The little blue heron is also an elegant wader. It is common to see these birds around salt ponds, on mangrove islands and in lagoons. The young herons are snow white before their first molting. The cattle egret was first reported in the Caribbean in the late 1930's. Standing about 20 inches tall the snow white egret eats small insects and lizards. It is often seen in cow pastures around the Virgin Islands, often standing on the backs of cows. Various species of doves are to be found in the Virgin Islands. The cooing Zenaida dove is quite similar to the American mourning doves and are commonly found and often heard in the islands. Not commonly sighted is the bridled quail dove. When it is seen it is usually searching for seeds on the ground in densely forested lowlands. It is an endangered species primarily because its eggs and young are eaten by feral cats and mongooses. Additionally development of lowlands have heavily disturbed their feeding and nesting areas. In the Vieques some commonly sighted insects/bugs include roaches, bees, butterflies, grasshoppers, mosquitoes, flies, ants termites and spiders. Other insects/bugs that exist here and are not commonly sighted but common none the less are moths, caterpillars, millipedes, beetles, tarantulas and scorpions The few insects/bugs listed here are only a handful of those that exist. The two insects most commonly encountered by visitors and residents are mosquitoes and 'no see ums' or gnats. No see ums are tiny biting insects that are often found on beaches in the late afternoon or in heavily forested areas around decaying, moist organic matter (trees, leaves, bark). Their bite resembles that of a mosquito and often they bite the lower legs.